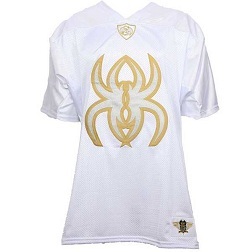 One of the best Krizz Kaliko merch items is the Krizz Kaliko White Spider K Football Jersey. This one in particular is my favorite merch item from Strange Music because of how unique it is. The huge spider logo on the front gives the jersey a crazy look. The awesome Strange Music logo on the back makes this a hot jersey to represent the label with. Everything about this jersey is great, especially the tough material it’s made from. Click here to purchase your very own!